We made one batch of plum chutney. tangysaltysweetpicante! Luz has a batch of plums dehydrating in the oven and I’ve got a small pot stewing with yerbanís with which I plan to make some very unusual paletas. 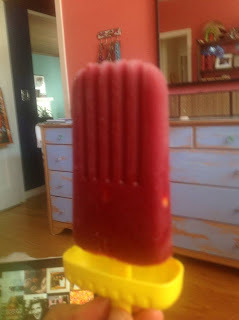 I was a little grouchy from the heat (as usual) and paletas are my usual treatment for the grouchies, but we were out. And then I remembered the paleta molds. I cut the pits out of the plums. Put them in a pot (skins and all). tied together several springs of yerbanís (mexican mint marigold, mexican tarragon) and added it to the pot. Heated it gently until the plums started to break down. Added a couple of tablespoons of honey (still very tangy), covered teh pot, removed from heat and let it sit about twenty minutes. Took out the herbs. pureed the plums. poured into popsicle molds. The yellow flecks are flower petals. The color is even more intense, but in the time it took me to snap the photograph, it frosted over.